Keeping up with its tradition of celebrating all things geeky, Google released one of its homepage doodles to commemorate NASA spacecraft Juno's journey to Jupiter. The NASA probe completed its five-year voyage to Jupiter's orbit on late Monday night, skimming through the planet's harsh climate at 130,000 miles per hour. Operating as the farthest solar-powered space craft from Earth, Juno's goal will be to study the origin and evolution of the largest planet in the solar system. And without fail, Google turned its 3.5 billion searches per day into an adorable celebration of Juno's big break. The NASA team celebrated Juno's successful entrance into the Jupiter orbit at 11:53 p.m., Eastern Time, after receiving a signal from the probe that it had come to the end of its five-year journey. The team got the news at the navigation facility at NASA's Jet Propulsion Laboratory in Pasadena, California. 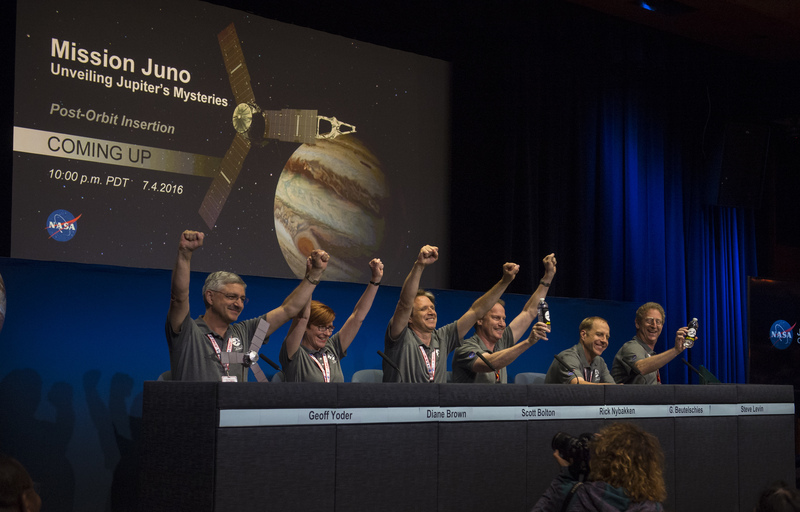 As Juno principle investigator Scott Bolton put it, this celebration meant that he didn't even mind "being stuck in a windowless room on the night of the Fourth of July." So as Juno confirmed its safe passage to Jupiter at the end of the holiday, the crew erupted in cheers – no fireworks needed. NASA Administrator Charlie Bolden echoed those sentiments, saying, "Independence Day always is something to celebrate, but today we can add to America's birthday another reason to cheer — Juno is at Jupiter. And what is more American than a NASA mission going boldly where no spacecraft has gone before?" The Google Doodle shows the crew celebrating as they watch Juno project its findings back to Earth. The 8-bit style characters jump up and down as the spacecraft makes its way around Jupiter, and Juno gets in on the fun by showing off its own celebratory emoji. And the team certainly had plenty to cheer about. Bolton called the mission "the hardest thing NASA has ever done." The follow-up to the voyage will be well worth the risks it took to get there. Juno's long-term goals will be to investigate the magnetic and gravitational fields present within and around Jupiter and measuring the amount of water in the atmosphere. NASA believes the findings will lead to a better understanding of how giant planets form, as well as the role they play in conjunction with the rest of the solar system. With plans for Juno to be in orbit until early 2018, both Google and the NASA community can keep on cheering.